This vibrant Augusta Italian ceramic cappuccino caffè latte cup and plate is a perfect to use to serve cookies and a hot drink. The cup is ideal to hold a cappuccino, your favorite hot beverage, soup or ice cream. The Augusta plate has enough room for cookies, crackers or other snack. 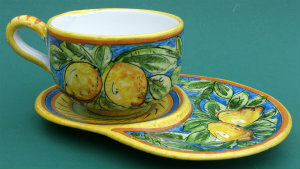 Made in the Umbria region in Italy, famous for Italian Majolica Ceramics and Pottery. This 16 oz. handmade hand painted authentic Augusta cappuccino caffe latte cup measures 3.25" in height x 4.75" in diameter. The biscotti cookie plate measures 9" x 7".